Hey “All That Jas Live” listeners! Jasmine and I are SUPER excited to hit you with another one of wonderful blog updates! On this blog we want to recap with you all of the fab gossip we talked about on November 3rd’s show and let you in on anything you may have missed! Below are all the hit songs we played throughout it! On November 3rd’s show Jasmine and I talked everything from Iggy Azalea’s hilarious halloween costume to overnight teenage twitter sensation #AlexFromTarget! Jasmine and I are loving these overnight celebs that keep showing up on our twitter feeds so being able to talk about new beau Alex from Target made us extra happy! First, lets stop and talk about how this random boy who was working this minimum wage job that probably paid for his newest xbox….ENDED UP ON THE ELLEN DEGENERES SHOW! Seriously….how lucky is this boy! I think everyone who knows me knows how much I love Ellen, so when I saw that he was on the show I died! Be sure to check out the link below to watch him on Ellen and see girls go CRAY CRAY for him! How do you feel about #AlexFromTarget? Tweet us at @AllThatJasLive and let us know and we’ll be sure to give you a shoutout and a follow back on next weeks show! We also talked about the fab Lupita Nyong’o and her being named Glamour Magazine’s “Woman of The Year”! WOOHOO! Jasmine and I love her so when we found out that she was named the woman of the year, we were SO happy!! Even though we loved all of the other’s who were nominated such as Mindy Kaling from “The Office” and her new show “The Mindy Project”, Laverne Cox from “Orange is The New Black” (MY FAV SHOW) and Chelsea Clinton, who we all know as Bill and Hillary Clinton’s daughter! 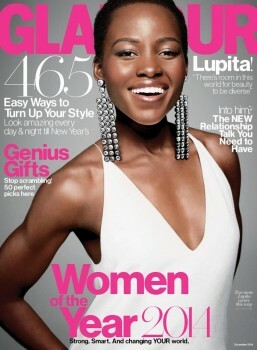 Check out Lupita on the cover of Glamour Magazine down below and let us know what you think of it at @AllThatJasLive! And last but not least, Jasmine can’t go through a show without talking about her girl Iggy Azalea. This week we talked about her halloween costume (which we loved) as her and her friend went as the two twins, Brittany and Tiffany Wilson from White Chicks! How hilarious is that!! But it gets even funnier….they didn’t go as the actual twins from the movie, they decided to go as the “undercover” version of the twins played by the Wayans’ brothers! Everyone says that she looks like the undercover version of the girls so she decided to go along with the joke! YES IGGY! We love you and totally don’t think you look like the twins at all, you’re gorg!